Save half the steps needed to create a print1: submit many files at a time, directly to the printer, without having to wait to open an application. Streamline your workflow: process large files quickly and easily with a 160 GB Hard Disk Drive. Increase productivity, save up to five minutes on every print and turn around orders quickly – print up to 41 m² (445 ft²) at maximum speed and 9 m² at production speed without sacrificing quality, using HP Vivera pigment inks. HP Instant Printing Pro streamlines the printing process from beginning to end with fast, easy file preparation, automatic nesting, preview, orientation and crop marks. Get accurate colours fast, easily, and cost-effectively – the embedded spectrophotometer enables automatic calibration and profiling, minimising expensive trial-and-error printing. Impress your clients with long-lasting, colour and black-and-white prints at up to 2400 x 1200 optimised dpi resolution. The Designjet Z5200 PostScript Printer from HP is designed to maximize your printing resources and make in-house printing more affordable. 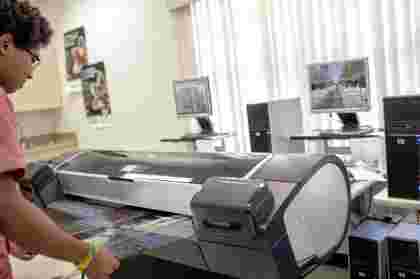 The large ink tanks cut down the cost per page and its automatic calibration saves resources by calibrating without printing a calibration sheet. The HP Vivera ink produces high-quality prints in both grayscale and color and is engineered to resist smudging, fading, and water damage. The printer has its own built-in 160 GB hard disk which means none of the computer's RAM is used for printing, letting you continue your work while printing large files. Having the built-in hard disk also means you can store commonly printed files in the printer for easy anytime access from anywhere on your local network. The printer comes with a browser-based interface that lets anyone connected to the network monitor the printer's progress. Included with the printer is HP's Instant Printing Pro, letting you add multiple files to the print queue without having to open each one. Once the files are in the queue you can dictate to the printer when the files should be printed. Because the printer constantly monitors resources, it's able to calculate whether or not it has enough supplies left for the next job, saving you time and resources. With this printer you save half the steps needed to get a print so it's easier, and you're more productive. 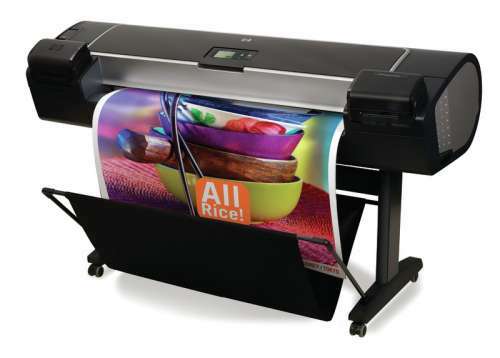 Take advantage of a printer that is so easy and intuitive, you'll wonder why you waited to bring large-format printing in house. Achieve your desired colors quickly while minimizing unnecessary and expensive trial-and-error printing. This printer's embedded spectrophotometer enables automatic calibration and profiling for greater color accuracy and consistency. Speed up the printing process by eliminating some of the time-consuming steps along the way. The HP Designjet Z5200 PostScript Printer lets you submit many files at a time, directly to the printer, without having to wait to open an application. Turn around orders quickly and still deliver the high quality that customers demand. With the HP Designjet Z5200 PostScript Printer and HP Vivera pigment inks, you can print up to 445 ft²/hr at production speed without sacrificing quality.